Stretching just over 350 yards, the first tee box sits elevated over the wide but bunkered fairway below. The green sits invitingly accessible at the end of the dogleg to the left and can tempt the longer hitters to take on the desert on the left and the massive waste bunker that will gobble up a driver not hit far enough. Bail right and decently hit drives will surely find one of the numerous pot bunkers that dot the right side of the hole. 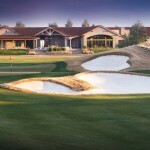 That may be all you need to read to book a tee time at one of the Valley’s most unique layouts. And I might usually refer to “unique” as a bad thing, but in this case I believe Greg Nash crafted a wonderful golfers playground that has the teeth to test the best players, but the soft edge to allow enjoyment for all skill levels. 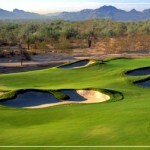 Southern Dunes Golf Club embodies the opportunity and challenge that face course designers in the Valley. 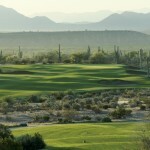 Southern Dunes blends the desert surrounding with a true links feel. With whipping winds and firm, fast greens expect your handicap to be tough to match on this layout that features a beautiful blend of modern and traditional features. You don’t have to look much further than the NCAA Championship trophy the ASU Women’s Golf Team brought home this June to know that the ASU Karsten Golf Course is a championship caliber golf course. And I can report the course in beautiful condition. 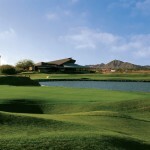 If you’ve never played ASU Karsten Golf Course, there’s no better time than now. If you’ve played any golf in Phoenix in the fall, you know that it’s transition time, time to say goodbye to those grainy Bermuda grass greens and say hello to the silky-smooth winter rye. However, the over-seeding process can put a damper on course conditions for a few weeks. We want to keep you informed so you can better make your decisions for golf in the next month or two. Twilight golf: get more for your money…while you still can. As the heat of the summer will surely press on, the summer months are dwindling. 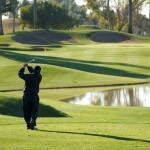 As kids start back to school, all of us Phoenix golf lovers can get ready for an uncomfortable green fee increase. However, it’s not too late to take advantage of some amazing rates at some of the area’s best courses. 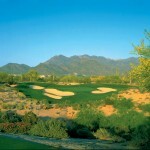 Designed by renowned architect Bill Coore and two-time Masters Champ Ben Crenshaw, the Saguaro Course opened in December of 2006 and has quickly garnered much deserved national attention. 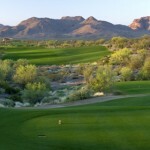 I’d be surprised if you haven’t at least heard of We-Ko-Pa Golf Club by now, as it’s name has been included in numerous “Best Courses” lists, including being named #1 Public Access Course in Arizona by GOLFWEEK Magazine. 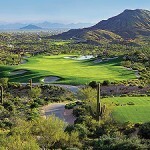 If you’re trying to figure out whether or not to go test your game at one of Grayhawk’s two championship golf courses, you don’t have do much more than turn on television coverage of any PGA Tour tournament. Not only does the Raptor Course host the Frys.com Open on the PGA Tour, but the unmistakable Grayhawk logo is perched on the front pocket of Phil Mickelson’s golf bag. There’s no question Phoenicians know what the biggest show in town is, the FBR Open. 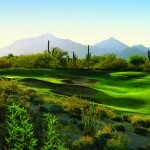 But with the recent renewal of contract for the PGA Tour’s second Phoenix stop, the FRYS.COM Open, Grayhawk Golf Club is trying to spread the word. After receiving a special exemption from the PGA of America, Allen justified the invite by winning the event, but not without drama. Allen rolled in a 10-foot birdie putt to beat the field and closest competitor Larry Mize by two strokes to end his 20-year victory drought. Allen joins Arnold Palmer as the only men in history to win the Alfred S. Bourne Trophy in their Champions Tour debut.